The relevant parameters of the modular design of the stainless steel water tank are based on the relevant provisions in the Code for Design of Building Water Supply and Drainage. 2, the water tank with SUS304, SUS316L and other stainless steel plate, stamping molding. High-quality stamping process, both to ensure maximum pressure requirements of the box, but also reduces the material thickness, with high strength, light weight, and can better prevent secondary pollution of water quality, environmental health. High-strength stamping plates and evenly distributed within the box of stainless steel reinforcement to make the box pressure evenly reasonable. 3, the modular blue-Bo Blue Bo stainless steel water tank is composed of three main standard modules; from 1000 Ã— 1000,1000 Ã— 500,500 Ã— 500 standard block, according to the different three-dimensional structure design parameters, using different thickness of the module, Welding in the factory or on-site assembly, on-site use of welding welding, wire selection ER308, H0Cr21Ni10 stainless steel welding wire, the surface of the weld passivation treatment to ensure that the weld is durable corrosion, the chassis using hot dip zinc Q235 -A carbon steel channel. 4, This product can be designed according to customer requirements 1-100m3 square combination of water tanks. 5, the water tank inlet, outlet, overflow, sewage outfall and into the hole, its size and location determined by the design. 6, the product is used as a hot water tank or expansion tank, the seal must be heat-resistant seals. 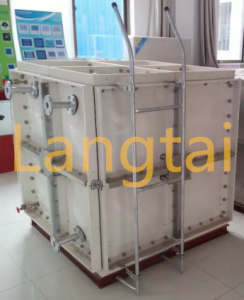 7, insulation tank, according to customer requirements, the use of different materials and technology. The geometric dimensions of the concrete foundation shall be formulated in accordance with the relevant provisions of GB02S101. Professional welder on-site argon arc welding. Construction site has a standard power supply. Around the water tank â‰¥ 500mm maintenance space. Appearance inspection without rust, no pollution: fill with water 2-3h, no significant distortion box, no leakage of qualified weld. When piping, do not apply excessive load to the pipe inlet and outlet. Do not apply the weight of the valve and the large diameter pipe directly to the water tank outlet. 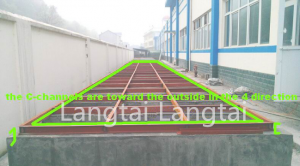 If necessary, set the pipe support: the expansion, contraction and vibration of the welded pipe must be equipped with flexible flexible joint.